Dr. Anna Fox is locked in her home due to agoraphobia and thus locked out of the world beyond her front door. A tragedy leaves her afraid to venture outdoors. Her safety net is now her home. Her routine includes socializing online in a support group, watching old thriller movies and spying on neighbors through the window. But one day, Dr. Anna Fox witnesses a possible killing at the neighbor's house across the park. But no one believes her! Did she hallucinate as a side effect of mixing medication with wine? Is she being framed? What is real?! Stephen King calls The Woman in the Window "one of those rare books that really is unputdownable." Gillian Flynn says, "Finn has created a noir for the new millennium." Two notable authors with an opinion I cannot agree more with. From the point of page one to the very last page at 427, I was deep into this story wondering what could possibly come next. So many twists. Tons of turns. Lots of questionable characters and brilliant writing. I love a book where nothing is as it seems. I see why this new book is published in 36 languages and already in development for the big screen. Well done, A.J. Finn! 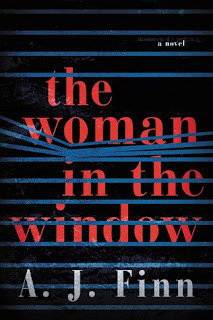 It may be early in the year, but I am already claiming The Woman in the Window as a Top Book of 2018. So glad I was nosy enough to notice a stranger reading it at the public library and borrowed a copy for myself!